The Food Safety Modernization Act (FSMA) was passed into law in ­­­­­­­­­­2014 to further the food safety of produce produced and consumed by the public. The US Food and Drug Administration was tasked to develop and implement regulations related to FSMA. Included in this is a comprehensive effort to train growers and suppliers such that they meet certification requirements of FSMA. FDA is working with public and private partners to ensure training programs meet the needs of those who must comply with the new FSMA standards, no matter their size, nature or location. It is important to make sure that those involved in the food supply chain know what training and education resources are available and how to gain access to the trainings. Understanding and implementing produce safety practices are important to the safety of fruits and vegetables and to the viability of their farm business. Produce safety practices may be required by many buyers, as well as federal regulation if the farm is subject to the FSMA Produce Safety Rule. In September 2016, the Indigenous Food and Agricultural Initiative (IFAI) at the University of Arkansas was named as the Native American Tribal Center for Food Safety Outreach, Education, Training and Technical Assistance. 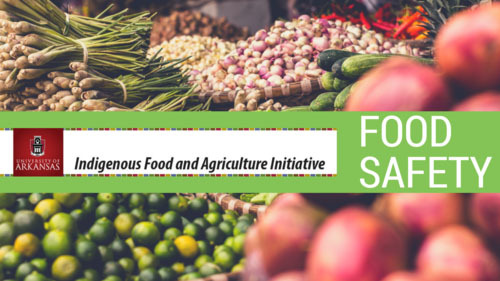 IFAI is cooperating with a wide array of partners, including the Intertribal Agricultural Council, to bring a series of webinars and face-to-face certification trainings to tribal producers and food businesses to fulfill requirements of FSMA. Learn more about the Food Safety Modernization Act and the Indigenous Food and Agriculture food safety team. Ready to take the next step in food safety for your operation? Sign up for an in-person training or webinar today!